Remember those really lame “snap” bracelets that came in a bunch of colours? Well the Moff is just like that except AWESOME. 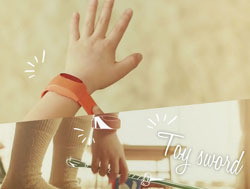 The wearable bangle is designed for kids and hooks up to an iOS app via Bluetooth 4.0. Via the app you can choose certain sound effects to be played at certain times, and a built-in accelerometer ensures a flick of the wrist plays an air guitar sound and lots of jumping plays boing boing noises – but kids can have complete control over which action does what. The Japanese-based company behind Moff is currently seeking funding on Kickstarter to make these fun, musical little bands a reality and for $45 you can get your hands on (or wrists inside) an early-stage prototype.